Muhammad Yunus, the practical visionary who pioneered microcredit and, with his Grameen Bank, won the 2006 Nobel Peace Prize, has developed a visionary new dimension for capitalism which he calls “social business.” By harnessing the energy of profit-making to the objective of fulfilling human needs, social business creates self-supporting, viable commercial enterprises that generate economic growth even as they produce goods and services that make the world a better place. 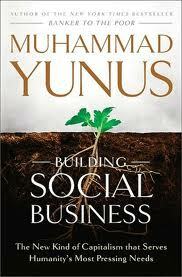 In this book, Yunus shows how social business has gone from being a theory to an inspiring practice, adopted by leading corporations, entrepreneurs, and social activists across Asia, South America, Europe and the US. He demonstrates how social business transforms lives; offers practical guidance for those who want to create social businesses of their own; explains how public and corporate policies must adapt to make room for the social business model; and shows why social business holds the potential to redeem the failed promise of free-market enterprise.